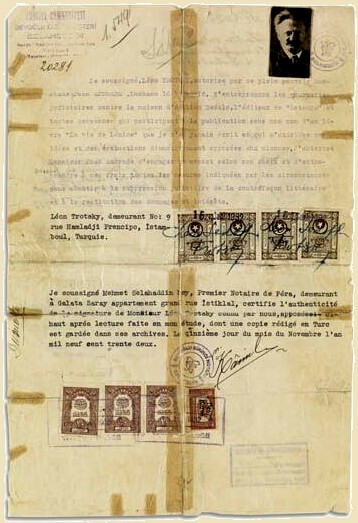 I the undersigned, Leon Trotsky, through this power of attorney, authorize Monsieur Juan Andrade , Luchana 16, Madrid, to undertake judicial action against the Dedalo publishing house, the publisher of Estampa and any persons involved in the publication under my name of the book The Life of Lenin, which I never wrote and which attributes to me ideas and judgments diametrically opposed to mine. I authorize M. Juan Andrade to hire a lawyer of his choice and to undertake at my expense whatever measures the circumstances indicate in order to arrive at the judicial suppression of this literary forgery as well as the payment of damages. 1. Juan Andrade (1898–1981) – Leader of the Spanish Trotskyists at the time this document was written, later a leader of POUM.